Thank you for participating in the Colorado Learning Attitudes about Science Survey for Experimental Physics (E-CLASS). We hope you find this report helpful for learning more about how your students think about experimental physics. On this tab of the report, you will find an overall summary of your students' responses and comparison data from similar level courses. For more information on how to read this report, or how this report was analyzed, see the "How to Read This Report" and "How This Report was Analyzed" tabs. The final tab provides a list of questions as well as the "expert-like" responses for each. TABLE 1. Summary of class participation. For a description of what qualifies as a valid response, see the "How to read this report" tab. FIGURE 1. Comparison between overall pre and post scores for students' personal views on What do YOU think when doing experiments for class? 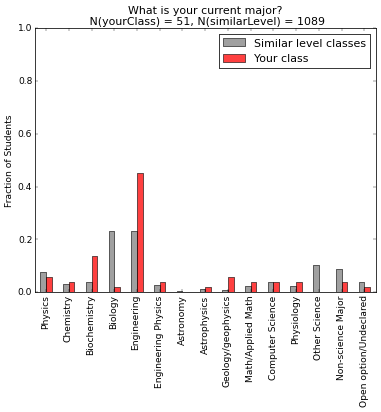 Your class (Red) is compared with all students in similar level classes (Grey), (i.e., either introductory- or advanced-level physics labs). The overall mean shown here averages over all students and all statements on the survey. The error bars represent one standard error of the mean. How do students' personal views change in your course compared to other courses? FIGURE 2. 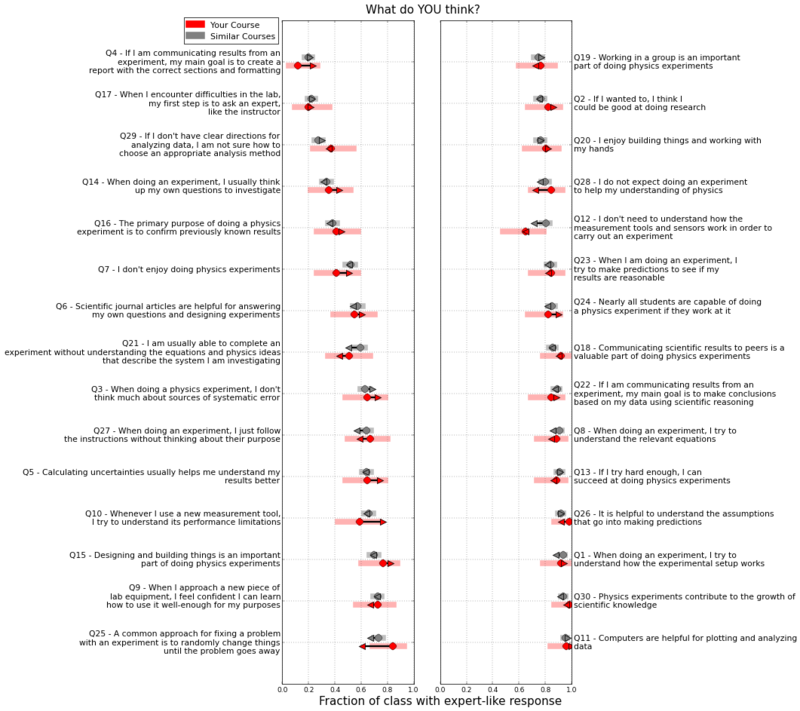 Pre/Post changes in students' personal views about "What do YOU think when doing experiments for class?" for your class (Red) and all students in similar level classes (Grey). The circles show the pre-survey values. The arrows indicate the pre to post changes. The shaded bars indicate a 95% confidence interval. The responses are ordered by the expert-like fraction in the pre-survey from similar level courses. Questions which show up on (or shift towards) the right side of the graph are "good" as they indicate a large (or increasing) fraction of students with expertlike views. FIGURE 3. Comparison for your class (Blue) between changes in the students' views about professional physicists and students in similar level classes (Grey). The circles show the pre-survey values. The arrows indicate the pre to post changes. The shaded bars indicate a 95% confidence interval. The responses are ordered by the expert-like fraction in the pre-survey. Questions which show up on (or shift towards) the right side of the graph are "good" as they indicate a large (or increasing) fraction of students with expertlike views. FIGURE 4. 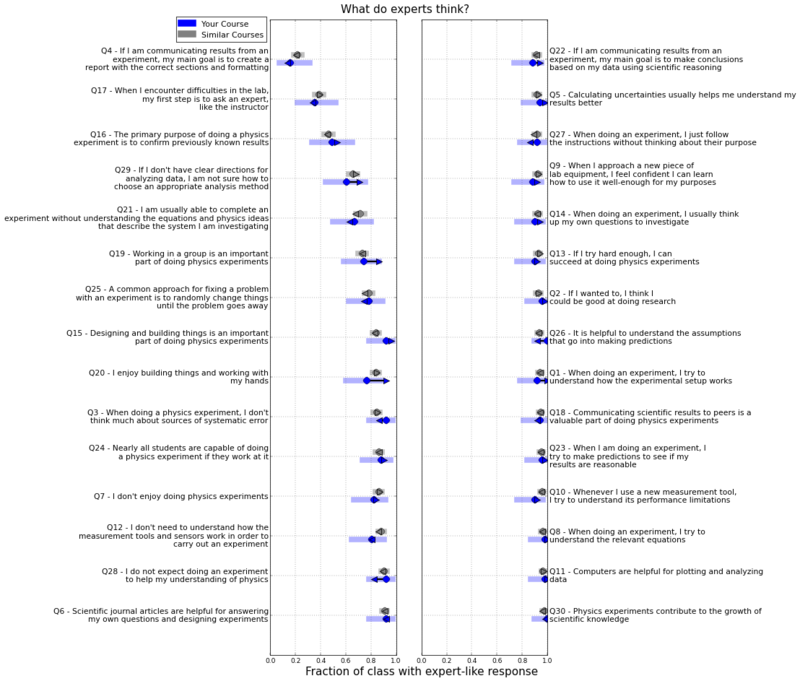 Comparison for your class between changes in students' personal views versus their views about professional physicists. What do YOU think... (Red) shows the change in students' response to "What do YOU think when doing experiments for class?" This red data is the same as the red data in Figure 2. 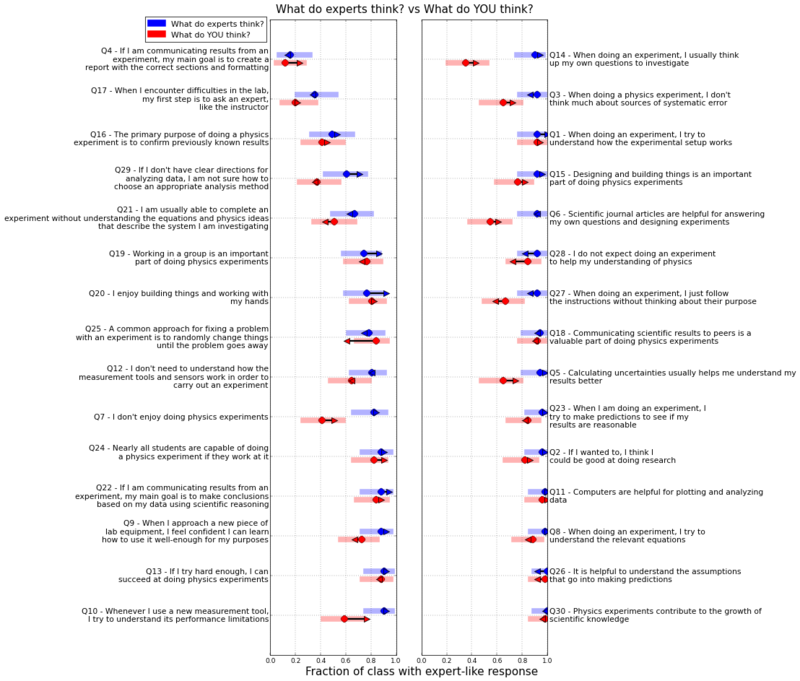 "What would experimental physicists say..." (Blue) shows the change in students response to "What would experimental physicists say about their research?" The circles show the pre-survey values. The arrows indicate the pre to post changes. The shaded bars indicate a 95% confidence interval. Questions which show up on (or shift towards) the right side of the graph are "good" as they indicate a large (or increasing) fraction of students with expertlike views. 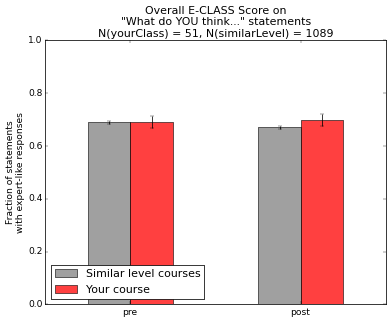 What did students think was important for earning a good grade in your course and other similar courses? FIGURE 5. 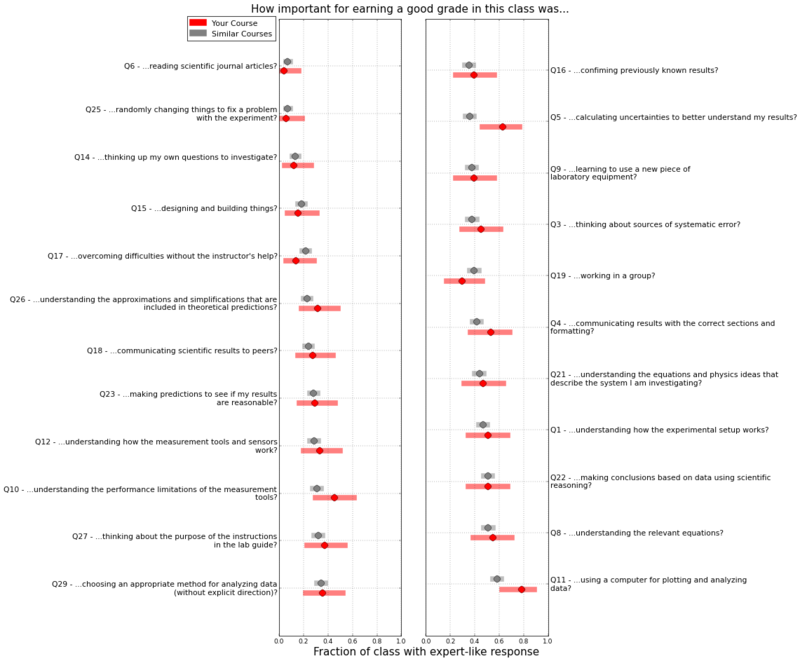 An ordered plot of students' views of importance of different activities for earning a good grade in your class (Red) and in similar level classes (Grey). The circles show the pre-survey values. The arrows indicate the pre to post changes. The shaded bars indicate a 95% confidence interval. Questions which show up on (or shift towards) the right side of the graph are "good" as they indicate a large (or increasing) fraction of students with expertlike views. FIGURE 6. Distribution of students by current declared major for your class (Red) and similar level classes (Grey). FIGURE 7. 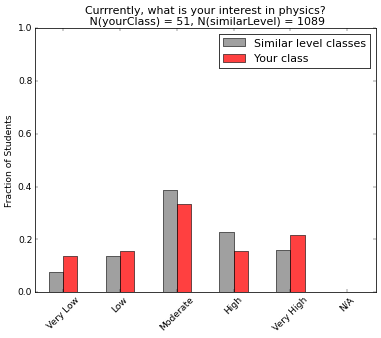 Students' current interest in physics for your class (Red) and similar level classes (Grey). FIGURE 8. 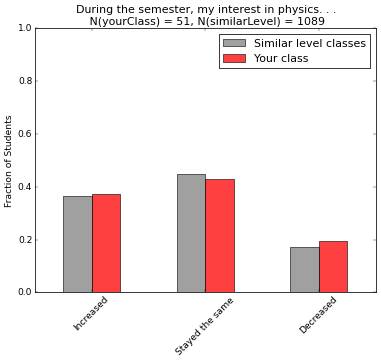 Change in students' interest in physics for your class (Red) and similar level classes (Grey). FIGURE 9. 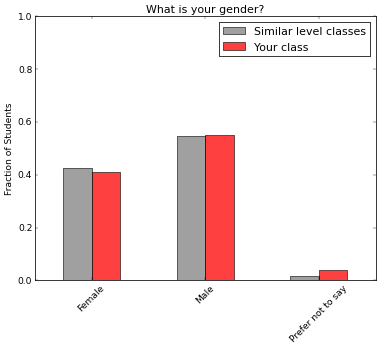 Gender distribution for your class (Red) and similar level courses (Grey). FIGURE 10. 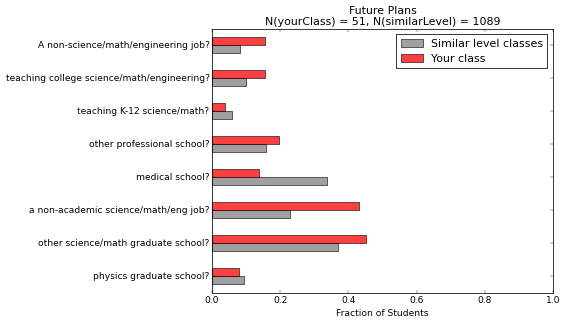 Future plans reported by your students (Red) and by students in similar level courses (Grey).